TYCO’s red-and-yellow Rock Island Century 430 diesel locomotive served in a number of train sets beginning in 1976. 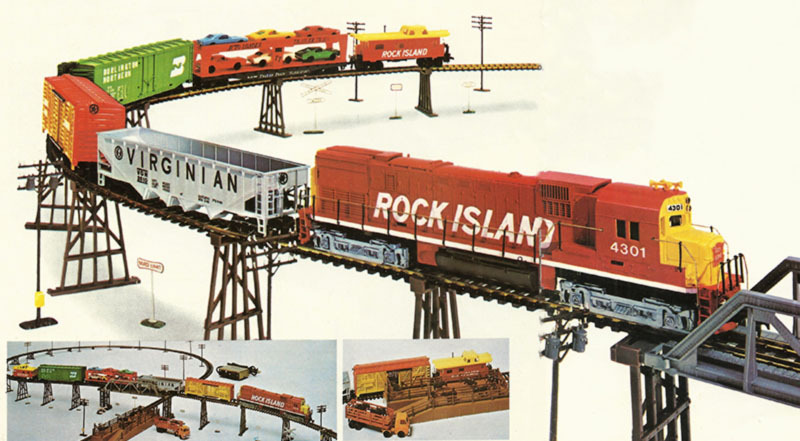 Following a number of years of using the Spirit of ’76 Century 430 on the point of train sets, similar sets return in 1976 with Rock Island for motive power and caboose road name selection. 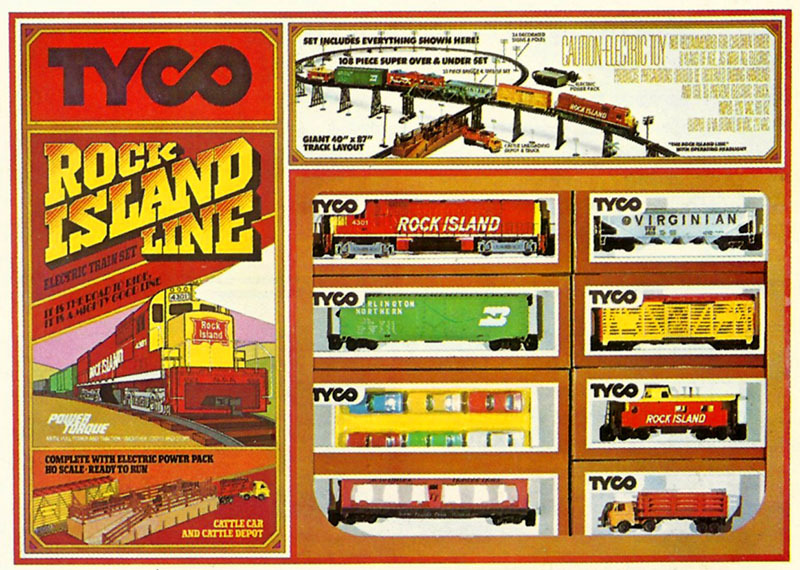 For TYCO’s 50th Anniversary catalog in 1976, the company includes The Rock Island Line (No. 7329) with a “Figure 8” track plan elevated by the inclusion of a 33-piece Bridge & Trestle Set (No. 909). This set provided a Rock Island Century 430 diesel (No. 235-10) pulling a silver Virginian hopper, red-and-yellow cattle car, green Burlington Northern 50-foot plug door boxcar, Frisco auto loader with six autos, and streamline-cupola Rock Island caboose. To go with the cattle car, buyers received the rest of the contents of TYCO’s Cattle Car & Depot Set (No. 935), which included stockyard depot, truck cab with cattle trailer, and eight cattle figures. This set returns unchanged in 1977, 1978, and 1979. The same year, 1976, TYCO introduced its Rock Island Line set, you’ll find another similar set, The Rock Island Freight (No. 7307). This set included a circle of track and the red-and-yellow Rock Island Century 430 and caboose came with a green Western Maryland skid flatcar with tractors, Heinz wood reefer car, and Frisco auto loader with six autos.